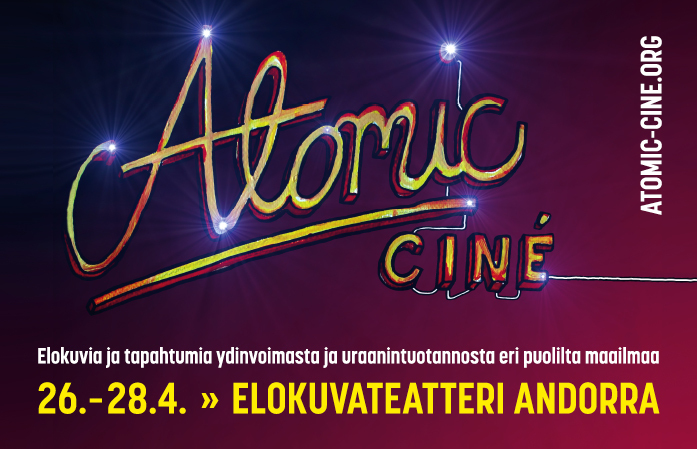 A new documentary film festival Atomic Ciné kicks off on Chernobyl day, the 26th of April. The festival focuses on nuclear power and uranium industry with award-winning films from Japan, USA, Niger, France, UK, Germany and Sweden, many of which have not been screened in Finland. The three-day festival is patroned by the film director Aki Kaurismäki. The festival's strong carrying themes are Japan before and after Fukushima, indigenous people and uranium mining, nuclear waste, nuclear weapons, and local initiatives towards self-sufficiency and sustainable energy production. Jean-Paul Jaudin’s All of Us Guineapigs Now? (France, 2012) discusses side by side the risks of GMO-technology and nuclear power. Jeff Spitz’s The Return of Navajo Boy (USA, 2000) tells a moving story of a one Navajo family’s century in Utah, where uranium mines have caused serious health issues. The movie project helped a family to reunite with their long-lost son. Irja Marten's Nuclear Waste in My Backyard (Germany, 2012) seeks to understand why attitudes towards nuclear waste disposal vary so substantially in Germany, Sweden and Switzerland. Atsushi Funahashi’s Nuclear Nation (Japan, 2012) follows the life of evacuees from Fukushima as the nuclear disaster situation changes over time. Hitomi Kamanaka's Ashes to Honey (Japan, 2010) tells a story of inhabitants of Iwaishima island who value their traditions and oppose a nuclear plant that is to be built across the bay. Meanwhile, communities in Sweden are building sustainable energy projects. Presentations and workshops offer the opportunity to dig deeper into energy questions. Philosopher Tere Vadén will talk about Peak oil and its impact to the society. Mining activist Jason Marshall gives a presentation of mining, resistance and victories. In Leena Pukki’s animation workshop participants can create short movies. The seminar on Sunday will focus on Talvivaara mine and the final repository project Onkalo. Festival clubs invite people to dance with music by Bye Mandu, Muuttohaukat and others.